This is one of the images that was shared for the Wednesday Challenge on one of my Yahoo groups and I finally got a chance to play with it. Isn't she the cutest baby! 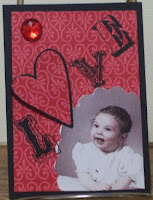 I used my sizzlits die to cut out the red heart, glued it to a scrap of the black cs and then cut it out by hand for a small mat. I printed the image from the group on regular copy paper and then used my Mega Marvy Scalloped punch to cut her out. I put her on at an angel and trimmed it to the scrap of red printed paper I found in my stash, then I mounted it all on a base of black card stock from Hollo's. I used Scenic Route Paper Co. Carnival Alpha Rub On's for the L, V and E. The heart was the O and I used a Zots pop up to put it on. I thought the corner was looking a little bare so I set it off with one of the doodlebug design jewels (ladybug). Labels: Doodlebug Designs, Scenic Route Paper Co.